As charities help our local communities in so many ways, it nice that we return the favor. 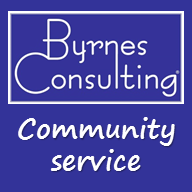 Byrnes Consulting is founded on the principle of helping others… and in most cases it is smaller charities that need the most help. Executive Service Corps of New England, is a group of over a hundred volunteer consultants that help nonprofit organizations in Massachusetts and Rhode Island. Along with working on charity projects, Mike Byrnes helps train other consultants, sitting on the marketing professional development committee, and has presented on the topic of online marketing and social media to over 5o nonprofits in the New England area. Mike was a recipient of the 2013 Edmund V. Marshall Outstanding Project of the Year Award and the “Above and Beyond Award” for both 2010 and 2011. Kevin Feehily began volunteering for ESC in 2012. Good Shepherd School new nonprofit opened its doors in 2009 to provide bilingual education to three, four and five year old children in a positive, enriching and challenging environment. To assist the program in its first year, Byrnes Consulting created a marketing strategy, put together a Development Committee (made of volunteers), and is worked to raise support to create scholarships so that additional impoverished children could attend the School.